The Mexican Tortilla Making Kit is for those who love making tortillas at home. You can make both traditional yellow corn tortillas or flour tortillas. We're also inlcuding a Tortilla Lovers Cook Book to find dozens of recipes for cooking with tortillas, as well as a Tortilla Oven warmer to keep them warm for almost one hour and an authentic round comal to heat them up. 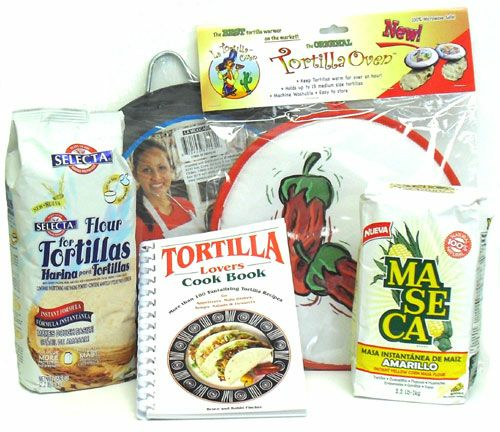 Este paquete para los amantes de tortillas incluye los dos tipos de harinas para hacer tortillas, la tradicional harina de maiz y la harina para hacer en tu casa las tortillas de harina, un libro que habla de todas las combinaciones de recetas con tortillas, un tortilla warmer que mantiene las tortillas calientitas por casi una hora y un comal redondo autenticamente Mexicano.